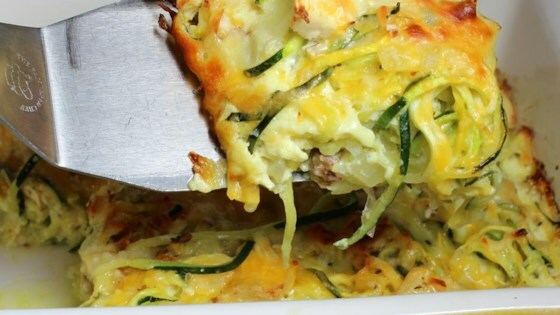 "This recipe was created to use up a large amount of squash we were given. We modified an existing recipe, swapping almonds for crackers and whole cream for milk. It satisfies my husband's diet and tastes great!" Mix raw almonds and 1/2 cup Colby-Monterey Jack cheese together in a bowl; stir into squash mixture. Whisk cream and eggs together in a measuring cup or small bowl; stir into squash mixture. Pour squash mixture into a 9x13-inch casserole dish; top with remaining Colby-Monterey Jack cheese and roasted almonds. I cut the almonds in half, used yogurt instead of whipping cream, and parmesan for the cheese. I also increased the butter and oil to 2 tbs apiece. Great idea for a recipe.